Location: 6th Ave. Plaza, west of 6th Ave. and Main St. 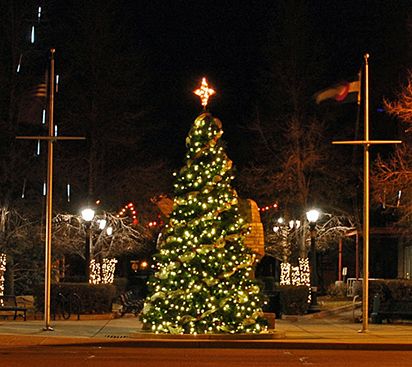 The annual Tree Lighting Ceremony in Downtown Longmont kicks off the holidays! Bring your friends and family and celebrate with us! Join Patrick Paws of LMNO Puppets as he and his puppet friends take a look at holiday celebrations around the world. After that, join us for the lighting of the big tree at Main Street! 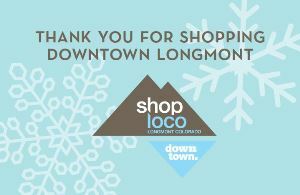 Enjoy everything Downtown Longmont has to offer all winter long, and be rewarded for your patronage! The Downtown Winter Passport is your ticket to some great prizes throughout December, January and February. Simply pick up a passport at participating Downtown businesses or print pages here (coming soon). Then, make purchases at participating businesses, collect passport stickers, and affix them to your passport pages to turn in to St. Stephen’s Plaza or 528 Main St. Drawings for Downtown Gift Cards will be held periodically throughout the winter, and all entries will qualify for our Grand Prize drawing at the end of February. 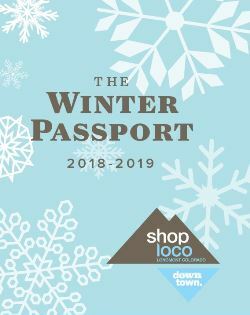 There is something for everyone Downtown – be sure to Shop Loco and Shop Downtown this winter. More information coming soon. This holiday season, when you Shop Local at participating businesses (list coming soon), you will receive Shop Loco Cards you can use for offers valid between Jan 2 - Feb 28, 2019. A list of businesses and offers will be listed here soon. You must have the Shop Loco Card to redeem the offer. Winter Wonderland - Saturday, December 8, 2018 - 3-5 p.m.
Join us at St. Stephen's Plaza before the parade from 3-5 p.m. for a Winter Wonderland: Music, Interactive Activities, Family Fun and More! Parade will be on Main St. and Coffman St., between 3rd and 8th Ave. in Downtown Longmont! Main Street will be illuminated with more than 60 floats twinkling with lights. Come watch this magical parade filled with marching toy soldiers, high school marching bands, ice castles, 12-ft. balloons, costumed characters and much more. Be sure to come down early and visit the many shops and restaurants Downtown! For more information about the parade and the weekend holiday activities, visit the City of Longmont website.